Ever been on a cruise ship where getting food is a challenge? Introducing Royal Caribbean Mariner of the Seas, where cost-cutting was perfected to a prison ship level. Recently remodeled, the ship looks shiny and spacious. Boarding even with luggage was efficient. The first 30-minute line was encountered at the Promenade Cafe - the only place to get food without paying extra, until the dining rooms and buffet open for business. Sandwiches, pizza, cold cuts, and cheese were the only choices. At dinner time formal dining rooms offer 30-minute wait to get seated and 30 more to get served. The buffet was crowded and food selection was shockingly poor, compared to Celebrity, Princess, even Norwegian. Servers were forcibly adding new diners to occupied tables as there weren&apos;t any empty tables available. Announcements encouraged the guests to eat quickly and leave to make room for other guests at the tables. Sky Pad augmented reality trampoline jumping was exciting and surprisingly included without extra fees. Other than the Sky Pad, the layout is geared to generate revenue from the passengers. You could not sit down without being solicited to buy a drink, merchandise, or a shore excursion. Photographers at scenic places throughout the ship would block your path and require over a minute of negotiation before graciously permitting the guests to move on. In the morning the tender service to Coco Kay private island was delayed until 11 AM due to "tide", while the weather was perfect. Getting off the ship took 45 minutes. The island was nice, but free food was discontinued at 1 PM promptly, even though first passengers arrived on the island after 11 AM. Drinks at the bars were shamelessly watered down. Returning to the ship involved a 45-minute wait. Beach towel return was so well hidden - most guests could not find it and were surprised with a $20 fee at checkout. The formal dining, other than the long wait to be seated and another long wait to be served - was rather nice. Food quality was on par with other cruise lines. Again buffet food selection and snacks were the worst I&apos;ve ever experienced, including the Carnival cruise line ships. My interior cabin was small but comfortable and very clean. Rafael the room attendant did a fine job and was tipped accordingly. The room phone worked fine room to room, but getting room service or an operator was impossible - no answer at any extension, not even at the spa. Disembarking had to be completed by 8 am, which was impossible because dining opens at 7 and service counter to correct the billing or pay with cash had a 45-minute long line. Printed instructions advised to leave your packed bags outside the night before or leave by 7 am if you want to carry your bag. The labyrinth path to get off the ship was complex, but the line was moving smoothly. The new Royal Caribbean terminal is shiny and features comfortable seating, but using the seats were not permitted, as passengers were driven along to the exit like cattle. The 3-day Bahamas cruise was an intellectually stimulating experience, but why do I feel exhausted and not rested afterward? Ever been on a cruise ship where getting food is a challenge? Introducing Royal Caribbean Mariner of the Seas, where cost-cutting was perfected to a prison ship level. Recently remodeled, the ship looks shiny and spacious. Boarding even with luggage was efficient. The first 30-minute line was encountered at the Promenade Cafe - the only place to get food without paying extra, until the dining rooms and buffet open for business. Sandwiches, pizza, cold cuts, and cheese were the only choices. At dinner time formal dining rooms offer 30-minute wait to get seated and 30 more to get served. The buffet was crowded and food selection was shockingly poor, compared to Celebrity, Princess, even Norwegian. Servers were forcibly adding new diners to occupied tables as there weren&apos;t any empty tables available. Announcements encouraged the guests to eat quickly and leave to make room for other guests at the tables. Sky Pad augmented reality trampoline jumping was exciting and surprisingly included without extra fees. Other than the Sky Pad, the layout is geared to generate revenue from the passengers. You could not sit down without being solicited to buy a drink, merchandise, or a shore excursion. Photographers at scenic places throughout the ship would block your path and require over a minute of negotiation before graciously permitting the guests to move on. In the morning the tender service to Coco Kay private island was delayed until 11 AM due to "tide", while the weather was perfect. Getting off the ship took 45 minutes. The island was nice, but free food was discontinued at 1 PM promptly, even though first passengers arrived on the island after 11 AM. Drinks at the bars were shamelessly watered down. Returning to the ship involved a 45-minute wait. Beach towel return was so well hidden - most guests could not find it and were surprised with a $20 fee at checkout. The formal dining, other than the long wait to be seated and another long wait to be served - was rather nice. Food quality was on par with other cruise lines. Again buffet food selection and snacks were the worst I&apos;ve ever experienced, including the Carnival cruise line ships. My interior cabin was small but comfortable and very clean. Rafael the room attendant did a fine job and was tipped accordingly. The room phone worked fine room to room, but getting room service or an operator was impossible - no answer at any extension, not even at the spa. Disembarking had to be completed by 8 am, which was impossible because dining opens at 7 and service counter to correct the billing or pay with cash had a 45-minute long line. Printed instructions advised to leave your packed bags outside the night before or leave by 7 am if you want to carry your bag. The labyrinth path to get off the ship was complex, but the line was moving smoothly. The new Royal Caribbean terminal is shiny and features comfortable seating, but using the seats were not permitted, as passengers were driven along to the exit like cattle. 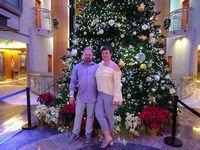 The 3-day Bahamas cruise was an intellectually stimulating experience, but why do I feel exhausted and not rested afterward? Clean and comfortable, attentive attendant.